“Will you be doing that trail that people take to find themselves?” I was asked by my Sister before I actually thought, “Huh, why not?” about two years after. I had run away from winter 2017 to South East Asia- the reason for this blog title. I stayed in India for about 1.5 months. This country is a separate world, full of contradictions where love and exploitation go hand-in-hand and are received from everyone around you. I flew to Thailand where, after I volunteered as a Shepherd for a few weeks, I hitchhiked all the way down to Singapore to catch a flight back to Bulgaria for the spring (I arrived during a blizzard so I don’t know if you can call it that). I felt like a prodigal son of sorts. When the plane landed, I felt as if I was coming back to a place of safety and love. An interesting experience for sure. But all of this is not the purpose of today’s blog post. The point of the above is to explain just how I came to have no more money, and this is an important event in my life which would lead to a grand change in my personal thinking, travel style, and relationships with others around me. What was this event? Well, primarily, I was robbed in Malaysia. Womp, Womp, Womp. Kuala Lumpur, city of the most disgusting fruit, Durian, I have ever put in my mouth (Imagine soggy bread that tastes like onions). Left my bag for a few minutes at a café/bar and bam, all of my emergency cash was gone. Left my passport and debit card which I am grateful for. But what to do, aye? I already paid for my flights for the next few months. Well, no need to worry for now. Stayed in Bulgaria for a month before flying to Berlin to meet a friend and hitchhike across Europe- Needed to pick up my hiking equipment in Zakopane, and then make my way to Spain for EL Camino. There are a handful of different trails all labeled EL Camino, but with different traits which they are subtitled for: Camino Frances, Camino Del Norte, And more. I spend a little on a bus to Irun for the Northern Camino after learning about three stereotypes for this particular walk- 1. Significantly less people, 2. More beautiful views, and 3. It’s more difficult. All three of which were true. Well, what was my problem? I only had 120.00 Euro and only 14.00 USD in my bank account. I had some rules however. Never ask for anything other than water. Accept only from people who want to give, do not use guilt speech. Do not be angry if people do not give. Thus began my journey of sleeping outside in rainy weather, having shoes that were literally falling apart at the seams, being dirty almost everyday, and going hungry often. Here are some lessons, and maybe bits of wisdom which I have gained from this adventure. Upon Realizing You Have No Money. At the time, I had 120 Euro. This is not enough to hike the next 30 days, but it was enough for at least a week or two, so I focused on this instead of what would happen to me after these weeks. I was worried, and this stress was constantly turned on like a leaky faucet, not really noticeable, but it builds after awhile. The first time the water was let down the drain was when the religious community ‘Twelve Tribes’ gave me tea, eggs, and the most delicious bread I have ever tasted. It was only the first day, but I cried from this free love. A ferry man let the 1 Euro fee pass for me, and the same religious group offered me a place to stay and food in exchange for work. “You can stay as long as you need to, my friend.” I moved on however, and they gave me more food. There is a lot of flapping back and forth between serene peace and desperate anxiety. But I worked through these sprouts of doubt, reminding myself of biblical teachings such as “The Lord God gives even to the sparrows their daily food, how much more will he give to you?” along with constant reminders that I have made it this far just fine, and that I need not worry about tomorrow. This was a lesson for me: I ran out of money, and still there is a way- the way of Love. Everyone you meet along the Camino asks you for your story. They seem interested, until the words, “I have no money” fly from your lips, and then they want to run away from you. This happened countless times, the judgements come like the rain which accompanied almost every day of the trail. When you have no money, somehow everything you say is heard with suspicion, your advice is scoffed at, and your lifestyle loses credit. This was an incredibly interesting experience for me, as I am quite used to be listened to and asked to share the wisdom which I have. To go from a popular world traveler to a homeless and dirty bum was a very powerful transition. I felt very lonely at times, and often like my value as a human was only based on where I stood on the economic ladder. I was often laughed at when I said that more people should travel. I was advised to leave my “silly” lifestyle to pursue something that is beneficial for my bank account. All of the people who told me these things were, very often, deeply unhappy with their lives. And yet I, with no penny to my name, was smiling everyday. Not everyone judges you for this of course, and I did meet many people (mainly towards the end of the trail) that were inspired and excited for the way I lived. They encouraged me, interviewed me in one case, and talked of me to their family members. One man remarked, “I told my mother about you and she was so amazed that you have such a positive attitude in your circumstances, it’s really inspiring man!” And many other similar statements. I met some people here that I am greatly looking forward to seeing again, hopefully I will make this happen in the next year. Upon Receiving What You Need. Sometimes, travelers gave me money. Sometimes beer, a hot meal, or they paid for my groceries. This was not so common for me however, and so still the little that I had slowly declined more and more. I never had to pay for accommodation because I had my tent with me. 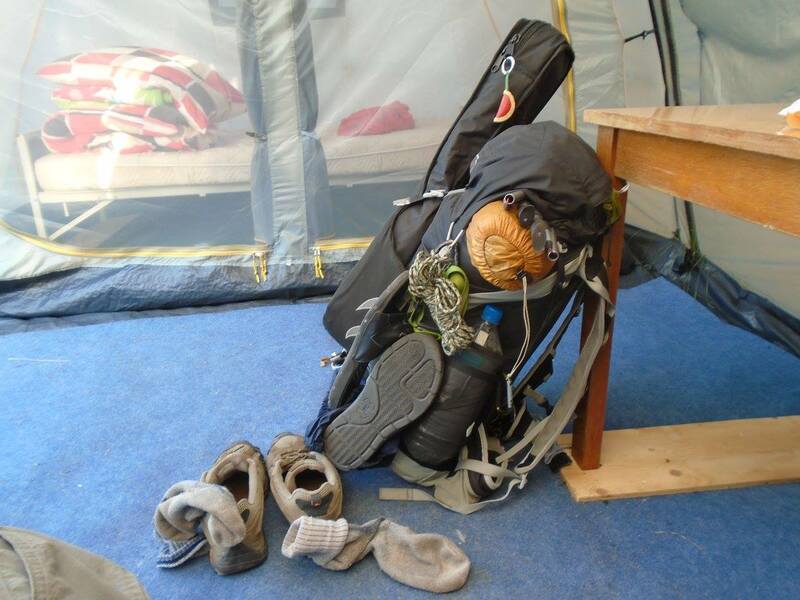 Two or three times, the Camino Albergues allowed me to stay for free or sleep on the floor. “You can sleep here… but I’m not telling you this…” Yes sir, thank you sir. Many Albergues would straight up say, “NO, This is not a charity house!”. And in one case, I wasn’t allowed to use the toilet or get water from the tap because “This is not a public toilet.” I have received much strife from the people, but in the end I always found a way to sleep someone safe and usually dry, which is the important thing. There is no rule that says people must make exceptions for me, or to give me kindness. I know this now, but I hope that I can now recall the feelings I had, and give to those who ask of me in the future. There is also something VERY humbling about having to rely on those around you. I had no power. No say. No independence. I had to take what they offered me. I had to admit that I could not do it alone, that I, in fact, needed other people like a child needs a parent. I felt very ashamed of this for many days. It took me a long time to simply receive from those around me what I needed. Though I learned that some people wanted to give to me, and if this was the case, I felt very happy. These sorts of people never treated me like I was nothing, but instead saw me as a human being. I liked these people very much, and they taught me how to take what I need from giving hands. This later transformed into the understanding that everything I own, in fact, are simply consequences of having received something for free. My clothing, my backpack, all of my things came from an income that came from a job that came from someone offering me a job. I didn’t do anything to accidently bump into someone who knew of so-and-so and that whats-his-face needed a worker, etc. My very first job at 16 years old was given to me because my elder sister was already working there and put in a good word for me. My job at DEC came to me because a Ukrainian woman told me about it. I did not choose to be born in America with the family I had or the opportunities that came to me- all I did was take the fruits of life at my feet. I didn’t produce a single one. And so, I began offering not only what was given to me on the trail, but also what I had already. At the very time I was contemplating all of this, I stayed at an Albergue by donativo. These were donation based places, often in dormitory style, sometimes with food included, but mostly with cold showers (or no showers), and sometimes risked bedbugs. But this one was beautifully run by a man named Abuelo Earnesto. I was told about the projects he has done for Spain including a youth project by working free trade over seas, a prison project where convicts could volunteer in the Albergue instead of staying at the prison, and the Pilgrim project to create a safe place for those who walk the trail. So moved was I about the work he was doing, so touched by his devotion to prisoners, that I felt a still, small voice inside of me, “Give all the money you have to this group.” I already knew that the entire place ran on money donated by the pilgrims, that no government or religious institutions funded this spot. I had a great fight inside of myself at this point. “I need this money for myself,” I thought, “Just give 10, and be done with it.” Things like this came and went from my mind. Donate money when I make more money, you deserve everything you have, etc. At this time over dinner, I spoke with two lovely Australian women who said to me in a topic totally unrelated, “Sometimes you just need to let go of your fears and do something crazy for the life you want. Don’t let fear run your life.” And they had no idea that they gave me the last push to drop all my remaining currency (Which had gone back up to 120 that day from a person who gave me money for new shoes), into the donation box. my thought was, “Well, that’s that.” and somehow I felt freed from something deep inside of me. Maybe being unchained from money, something I had my entire life, was a deep fear that when I let it go, I realized it was only an illusion. But I was very afraid. I prayed to a God that I felt distant from, “What will happen to me now?” and I cried. And he was right. I had Busked in Malaysia which helped me get over my fear a bit. But now it was do or starve. So I did in Santander, I Did in Gijon, I did in Ribadeo and Santigao- and I made bank, guys. I made about 10-13 Euros every hour of playing. I had no Amp, and no electronics. Just me, my guitar, and my hat on the pavement in front of me. But I did it. There were times where I got to the next city with only 1 Euro in my pocket, such as when I eventually made it to Santiago, and again these times were frightening. But you can’t think about such fears, otherwise you don’t have the energy to make it further. Upon Living With Little and Finding Happiness. I made it to my goal. 30 days of hiking, 20-30 kilometers everyday, 9-10 kilograms on my bag. With shoes that had the largest holes in them, shirts with rips, damaged backpack, straps were breaking, my socks smelled so bad one could throw up, and I could only shower every 5 or 6 days. I went hungry sometimes. But I always smiled. In Santiago, I met many other people who completed the trail with no money. A friendly Irish lad, a rainbow German girl, and a very crude American guy who sang about vaginas. In the city there, I was instantly accepted into a community of homeless people when they saw me on the street with my guitar. I stayed for a few days and made over 200 Euros, I slept in a park by climbing over a very tall fence after midnight (and leaving around 7am), but I learned something. I don’t need much. And the adventure. A dear friend once told me that once you run out of money, the real adventure begins. There’s just something surreal about sneaking over a 3 meter fence at 1am, setting up a tent with the silhouette of a cathedral being lit by the moonlight, trying to be quiet. And there’s something so powerful in making it to the end of the world with shoes crumbling with every step, to succeed, to find new shoes just sitting on a rock, to eat food with the hippies, and dance around a large fire on the shore with good company and beautiful connections. I can do all things. One day, I hope to walk another Camino, but when that time comes, maybe I’ll have some money in my pocket. Now, I work at Ukraine once again for the summer to make some money once more. Life is good, life is beautiful, and always life will give you what you need when you need it. Any questions, write in the comments below, subscribe to the blog, and live the life you want. If I can walk for 30 days with no money saved, so you too can do all things. Click here to watch the youtube video of EL Camino. This entry was posted in Europe and tagged busking, busking in spain, el camino, el camino del norte, globe trotter, hobo, homeless life, long distance hiking, no money, the way of saint james, the way of spain, ultralight, vagabond, world traveler.